All Lakehills homes currently listed for sale in Lakehills as of 04/22/2019 are shown below. You can change the search criteria at any time by pressing the 'Change Search' button below. If you have any questions or you would like more information about any Lakehills homes for sale or other Lakehills real estate, please contact us and one of our knowledgeable Lakehills REALTORS® would be pleased to assist you. "Spectacular home on good waterfront. Granite counter tops, custom cabinets, designer lighting, with an open plan. 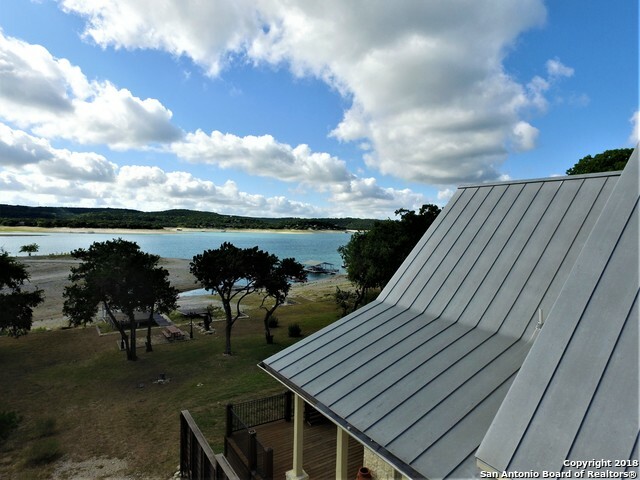 Rock home with high quality standing seam roof and a 3 car garage. Eat in kitchen with open plan and a walk in master bath shower and a whirlpool tub. Wood floors and travertine tile in the bathrooms. This is a wonderful home with many amenities with a great view. Home also has certain energy efficient qualities with 6 exterior insulated walls with a high quality dual HVAC air and He"
"Owner has created a retirement income, but life changed and he is moving. Property is worth more than $1,000,000 but the owner says SELL IT! Imagine having a turn key cabin rental business or how about an all inclusive retreat center! 6-1BR Cabins, a 3/2 1505 sqft House to live in or rent out, Food Service Building with commercial Kitchen ready for a roadside eatery business, Large Metal Workshop, Greenhouse, Office +. Medina River with private dock. 2.36 acres with 200 feet of road frontage. 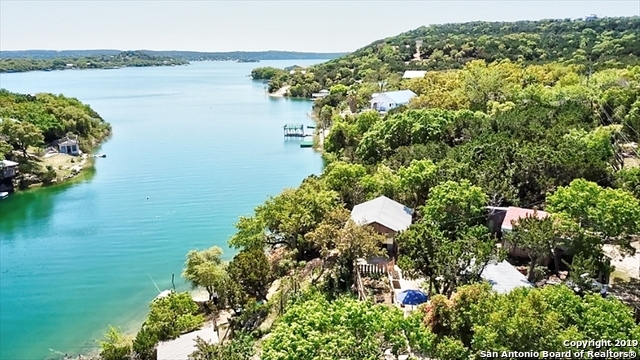 se"
"Magnificent waterfront on Medina Lake! 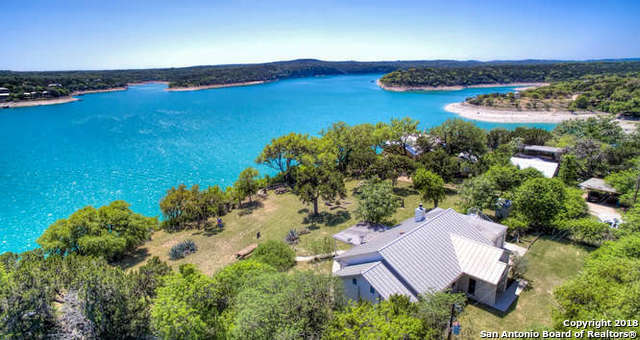 The grade and the depth of the waterfront is A+ because of its location which sits close to the riverbed that is Medina Lake. Studio guest house sits over the detached garage. Aluminum Boat Dock with a power boat lift. Located in a very quiet part on the point of Eagles cove. Beautiful, panoramic views. Two great living areas, The utility room is spacious. A secret retreat that is located upstairs past spiral staircase." 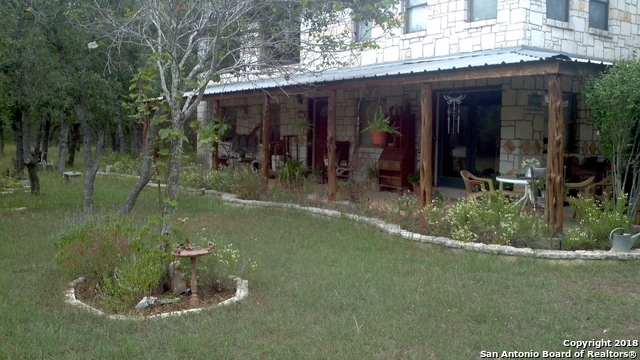 "Relax in this fantastic country home on 3.64 acres with FOREVER VIEWS of the LAKE & HILL COUNTRY. SPACIOUSLY DESIGNED,ENERGY EFFICIENT,FLEXIBLE OPEN FLOORPLAN.HIGH CEILINGS & LOTS OF WINDOWS.2 BEAUTIFUL ROCK FIREPLACES IN LIVING & GAME ROOM. LOVELY ENTRY WAY W/DOUBLE DOORS. OFFICE W/FITTED SHELVES. GRANITE & STAINLESS IN KITCHEN.SEPARATE DINING ROOM. BREAKFAST NOOK.PERFECT HOUSE POSITION,GET SUNRISE & SUNSET. OVER 1000ft OF COVERED PORCHES.UPSTAIRS BALCONY. PLANT NURSERY,PET RUN.LAKE ACCESS & HO"
"Custom built 2story open loft rock home on tree studded parklike 12+ acres. Open floor plan, 4 bedroom,2 bath. Master down.Cathederal ceiling, wood burning rock fireplace, 4 huge picture windows. Sit in your comfortable couch & stargaze or watch the clouds go by. Lovely wraparound porch. Metal roof, water catchment system(plus well). Oversized 2 car garage/workshop. Double RV barn. Ag pens, chicken coop,Seasonal creek. Massive oaks. Lots of outdoor space, privacy,wild turkey &deer. 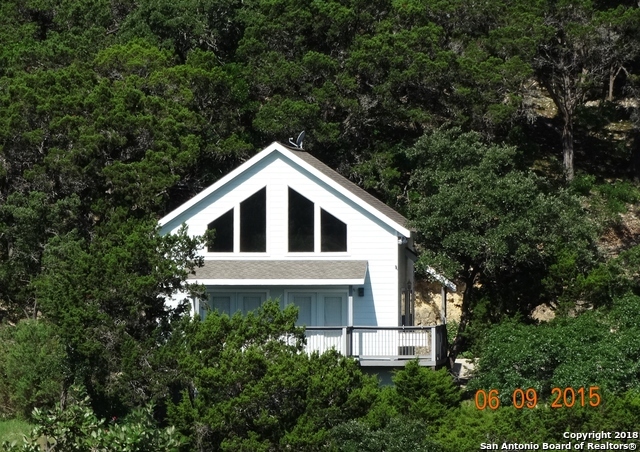 Next to a 200"
"This is a rare find at Medina Lake, this lakefront home is on the deep side of the lake. Has 50+ feet of lake front, House has 3 bedroom, 2.5 bath, one bedroom is upstairs,View of lake from back door and balcony.Master bedroom has view of lake. Shared driveway with 2 car carport under the deck. Recently updated and ready for the new owners. Please call CSS for an appointment. Owner will open. New deck on mainfloor with great view of lake. No dock!" "BEAUTIFULLY MODERN-WATERFRONT HOME ON MEDINA LAKE**119 FT WATERFRONT IN CHURCH COVE**MULTIPLE DECKS BUILT WITH TREX FLOORING,ONE COVERED AND ONE WATERSIDE**LOVELY KITCHEN WITH GRANITE COUNTERS, BREAKFAST BAR & STAINLESS APPLIANCES* SPACIOUSLY DESIGNED OPEN FLOORPLAN WITH GREAT FIREPLACE,4 LARGE BEDROOMS 2 BEAUTIFUL BATHROOMS-OPEN FLOORPLAN *LARGE DOCK WITH BOAT LIFT CONVEYS-GATED ENTRANCE LEADS TO CONCRETE DRIVEWAY & AN OVERSIZED GARAGE DESIGNED FOR BOATS & VEHICLES -WOW!" "Your Friday to Sunday just got a lot better! Awesome weekend retreat. 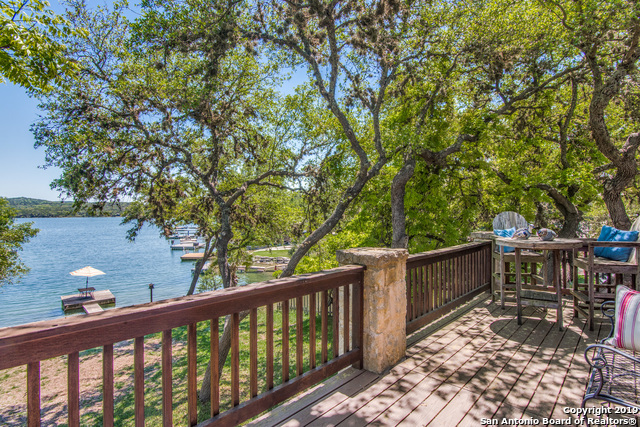 Private dock, 50ft waterfront, Natural rock bulkhead. Kitchen, great room open to large deck under majestic oak canopy. Vista views to East across the lake. Exhilarating sunrises and shaded afternoons! Gorgeous remodeled kitchen with gas cooking! Luxurious marble shower! Gated concrete drive with boat/RV parking. Lots of room on shaded waterfront lawn for outdoor kitchen and firepit! Convenient location MINUTES from NW S"
"LOVELY WATERFRONT HOME ON POPULAR PEBBLE BEACH W/100FT OF DEEP WATERFRONT. OPEN FLOORPAN W/HIGH CEILINGS.2/1 DOWN & HUGE LOFT UPSTAIRS THAT CAN SLEEP LOTS OF CHILDREN.LEVEL LOT,FENCED & GATED W/EXTRA STORAGE. HUGE COVERED PATIO W/FULL BATH,GREAT FOR PARTIES & ENJOYING THOSE LAKE BREEZES.COVERED DECK.HUGE 3 BAY DOCK W/2 LIFTS & STORAGE ROOM. HOME HAS OUTSIDE ELEVATOR.LAKEHOUSE COMES FURNISHED SO JUST BRING YOUR TOOTH BRUSH!!!" 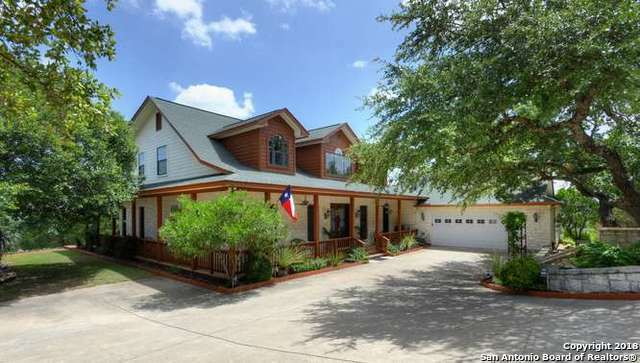 "Immaculately presented 4/2 on a oak studded 5.05 acres.Set back off road for privacy you are surrounded by wildlife! Beautiful kitchen w/knotty alder cabinets & stainless,walkin pantry & office nook.Kitchen island & bkfast bar. Huge living room w/Austin stone fireplace.Recent laminate flooring. Dining & breakfast room.Beautiful master suite with retreat/sitting area.Garden tub,glass shower,walkin closet. 68x30 s w/office.20x12 garage.Lots of covered decks.Lake access park.Gated community.HORSES "
"SALE INCLUDES 147 (1 BDRM 1 BATH) DUPLEX 2080 TOTAL SF 2-1 BATH EACH SIDE AND STONE HOME 1 BDRM 1 BATH. ON PLUM COVE OF MEDINA LAKE. MAKE GREAT AIR B&B, FAMILY COMPOUND, RETREAT OR JUST RENTAL INCOME PROPERTY. SELLER WILL CONSIDER OWNER FINANCE WITH 150K DOWN PAYMENT. QUIET RETREAT TUCK AWAY ON WATER FRONT. EVERY BUILDING HAS PORCHES TO ENJOY THE QUIET COUNTRY LIVING. 2 WELLS AND TWO SEPTICS. CAN PURCHASE ALL OR PART SEE MLS 1357265 AND 1351270 CLOSE TO PARK WITH FISHING AND BOAT DOCK MAKE GR"
"nice one story floor plan 3 bed 2 bath big large back patio serene country living. 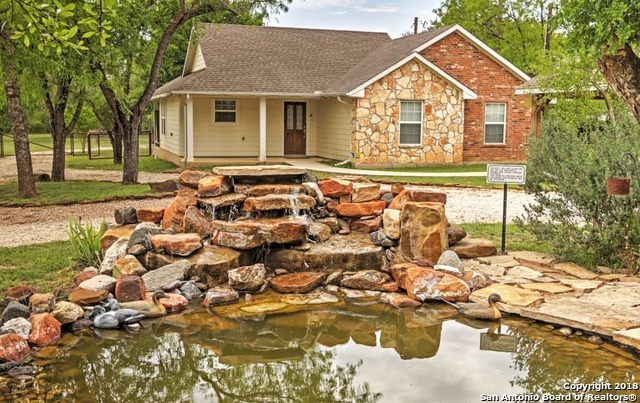 Nice HOA and access to pool,park and medina lake-in quiet culdesac. 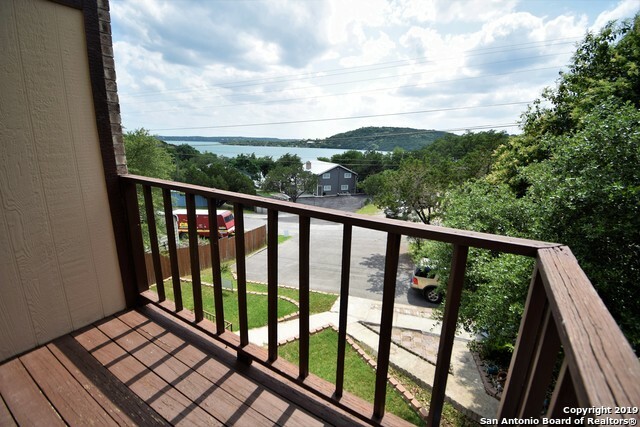 call for details"
"PANORAMIC MEDINA LAKE VIEWS,BEAUTIFULLY REMODELLED IN 2006,MULTIPLE DECKS ,METAL ROOF,LAMINATE FLOORS,BEAUTIFUL KITCHEN & BATHROOMS*SITTING UP HIGH-THE LANDSCAPE MEANDERS DOWN TO 102 FT WATERFRONT ON 2 SPACIOUS LOTS,FLOATING DOCK CONVEYS*TAKE YOUR BOAT OUT ON THE LAKE OR SIT AND TAKE IN THE VIEWS**ALL IMPROVEMENTS ARE ABOVE THE FLOODLINE*THIS IS A WONDERFUL SETTING *YOU WILL NOT BE DISAPPOINTED!!!" 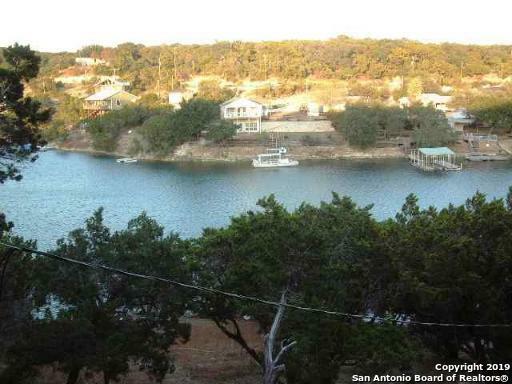 "Great water front property that has a towering view of Medina lake. The home has custom cabinets and granite counter tops. Living area is wired for a surround sound system. Has a three levels of decking with a dock. Has a nice hot-tub for relaxing and enjoying a midnight view of the lake. Garage is 9 feet tall to put in a large vehicle or a boat." "Property Is like having waterfront with out having to pay the waterfront taxes. Kitchen is custom stainless steel appliances. bathrooms are also have custom sinks. Hardwood floors through out the entire house. Has a Living room and family room living room has a excellent bar setup for entertaining guest. Has a nice tucked away gazebo at the front of the property that is easy to miss. Lake access is right across the street!!" 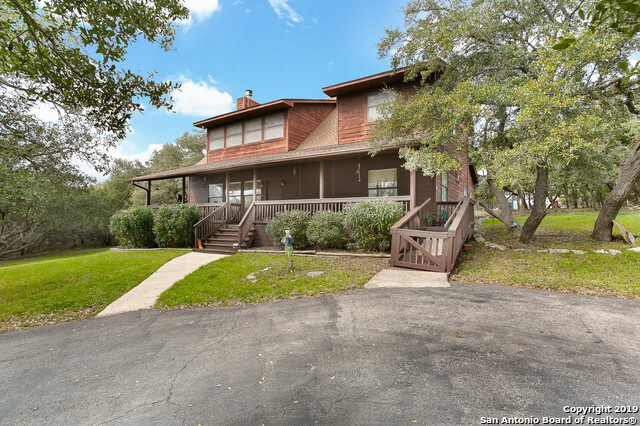 "76FT OF DEEP CRYSTAL WATERFRONT,BEAUTIFULLY REMODELLED 3/2 MANUFACTURED HOME,1984 SQFT (BCAD),VERY SPACIOUS & OPEN WITH FANTASTIC LAKE VIEWS,MULTIPLE DECKS,LOTS OF STORAGE,CARPORT,SEPERATE WORKOUT ROOM, WATERFRONT 1/1 GUEST COTTAGE -OPEN PLAN WITH KITHENETTE & BATHROOM-STEPS DOWN TO THE BEAUTIFUL MEDINA LAKE!!" "Spectacular two-story 4 bed/2 bath/detached car garage w/circular drive & 2 car carport, 2430 sqft home on greenbelt in Lakewood Estates. Master bedroom upstairs, 2nd story balcony. 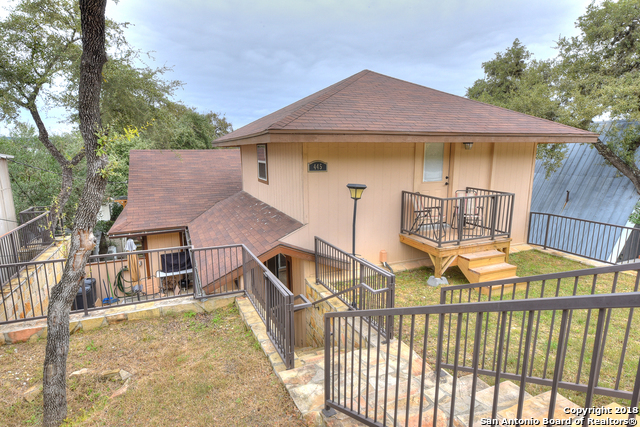 Located close to Medina Lake and Bandera Rd. Enjoy country living on the covered front porch overlooking 1.5 acres. Plenty of storage with detached work room. Bandera ISD. WELCOME HOME!" "A true piece of heaven, on Lake Medina 100'+- waterfront! The cabin is perfect for your weekend away with a full beautiful bathroom and claw-foot tub overlooking the lake. The Patio overlooks the gardens and lake. The 2 car carport and workshop along with above ground storage tanks help with the amazing organic gardens that include a vineyard and many different fruiting trees, and vegetable garden. Water well 480ft, There is laundry and a unfinished bathroom in the workshop. Extremely quiet an"
"For Sale Furnished or Not Furnished! 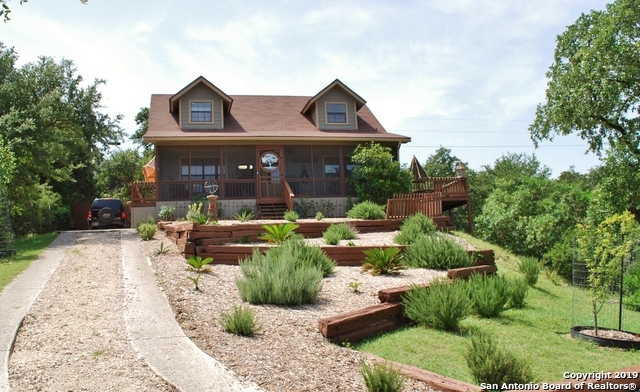 Country French Cottage situated on a Hillside with pristine views of Medina Lake and surrounding Hill Country. Guest Cottage with Guest Deck & Outdoor Shower. Professionally Re-designed with Custom Exquisite Details. Decks surround Cottages for Outdoor Entertaining. New AC/Heat Pump, Water Heater/Filtration/Softening System and Storage Tank. New Appliances, Wood Floors, Unique Vanities, Jacuzzi Tub. Option to purchase fully furnished! 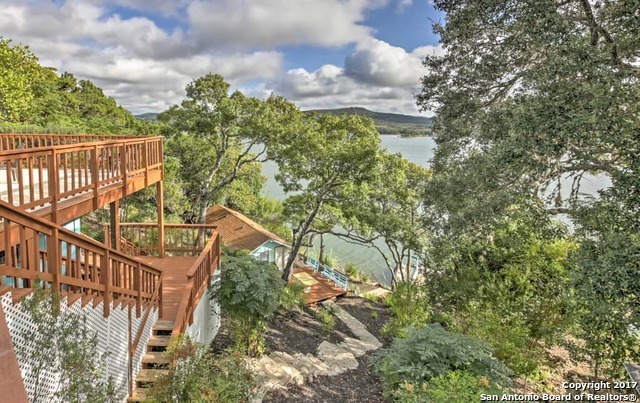 Ask Realtor for more in"
"Custom home on the lake, hidden back in a cove of Medina Lake. Are you looking for a nice get away on the water? This home has about 1200 sf of living area. Appraisal district has it as 720. I don't believe they are counting the loft area. When you walk out the door, you are about 100 feet from the water on you own dock. Appliances stay." 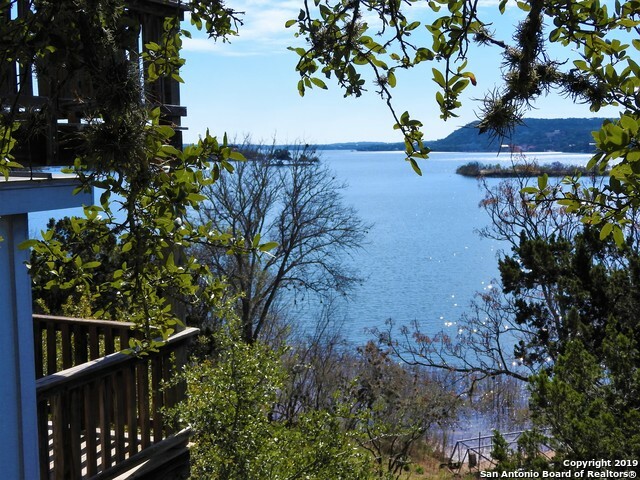 "Spectacular views of the lake from both the front porch and the balcony. Exceptional spacious yard includes 3 Lots with lots of parking for vehicles and water toys! Includes separate boat storage. Very well maintained lake house. 2 living areas, stainless steel appliances, washer & dryer included. Large Master Bedroom downstairs with ensuite master bathroom." "BEAUTIFUL DEEP WATERFRONT PROPERTY ON THE MAIN BODY OF THE LAKE. OLDER MANUFACTURED HOME PLUS CONSIDERABLE 'ADD ONS',PROVIDES LOTS OF ROOMS & STORAGE SPACE.4 BEDROOMS 1 FULL BATH. LARGE SCREENED PORCH. WORKSHOP & LARGE CARPORT. COVERED FRONT DECK TO ENJOY THE DEER FROM. 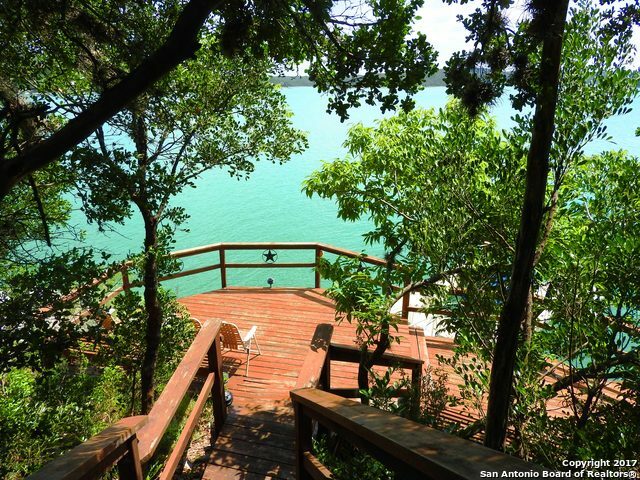 STEPS LEAD DOWN TO THE LAKE & FLOATING DOCK WITH LIFT. BUT THE VIEW IS AMAZING. HOME IS ON A WATER SYSTEM. THE VALUE IS IN THE LAND." "WATER FRONT BUT ALSO WITH A VIEW. HOME SITS AT TOP OF THE HILL BUT YOU OWN TO THE LAKE. THERE IS AN OLD CABIN BELOW AT WATER BUT NEEDS A LOT OF WORK. THE HOME IS GREAT. HUGE BEDROOMS, MASTER WITH A VIEW OF THE WATER. BIG LIVING/EATING AREAS DESIGNED FOR ENTERTAIN. 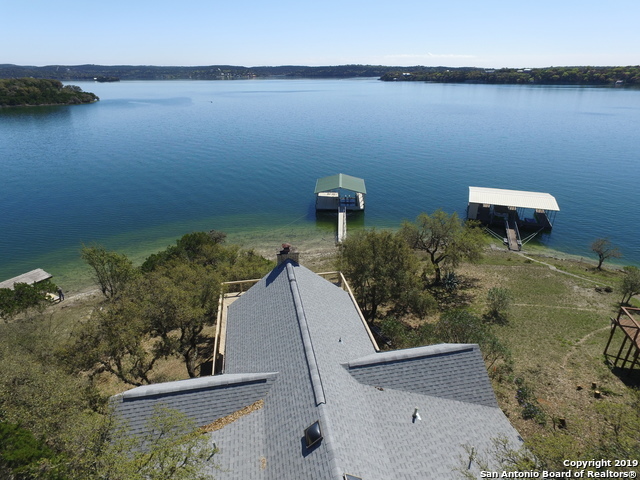 LOCATED ON 55 FT DEEP CHURCH COVE (LAST TO LOSE WTR IN DROUGHT) SELLER CAN PRVD A FLOATING DOCK WITH BOAT LIFT FOR 25K MORE. FURN. NEGOTIABLE. THE WALK TO THE LAKE IS DECKING BUT STEEP IN PLACES BUT WORTH IT. PARK AT YOUR LOT & PLAY T"